High Voltage DC Power Supply! High Voltage with High Amperage! awesome power supply. These are the plans we used in many of our free energy experiments. The plans do not show you how to build a 50,000 volt multiplier, but it is so easy to do by simply adding more caps and diodes. Any voltage over 1200 volts should use non electrolytic type capacitors. If you collect 2000 v capacitors from old microwave ovens that you see thrown out, you can make an awesome 50,000 to 100,000 volt power supply. I have seen old microwave ovens for sale at flea markets as well as Goodwill stores for less than $11.00 each. Microwave ovens also have HV diodes in then as well as HV transformers 1500 vac to 2000 vac. If you tried to buy these at a supply company it would cost you well over 100 dollars. The voltage multiplier in these plans are easy to build and low cost if you buy surplus capacitors and diodes from the Internet. 120 volts ac is applied into the input terminals and the AC voltage is changed to a smooth DC current. 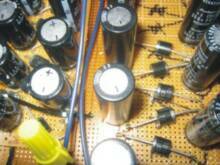 Voltage output will depend on how many capacitors and diodes you add to it. You can get anywhere from 300 VDC to 100,000 VDC. Most free energy projects use 300 V DC, 800 V, 1200 V, 5,000 VDC or 50.000-volts DC of earth shaking power! Up to 6 amps. Many uses for the serious high voltage experimenter. Create your own 12’ lighting bolts, We used this design for many of our free energy projects! Also great as a high energy weapon against dogs and for Anti-Gravity research.